Happy Thanksgiving. I hope every member takes a chance to recharge over the short holiday break as we come toward the homestretch of 2018. It has been a challenging year for many members and this short break comes at a much needed time. With so much going on and more on the horizon, we need to make sure we take care of ourselves. Yesterday, we received notice of our salary for this school year from Human Resources. The reality continues to set in that we are working without our step increase this year. I would caution everyone that this is not reflective of anything that has come from bargaining. When we reach an agreement with the school district on a new contract, part of that discussion will revolve around retro pay for a step increase for this school year. In addition, we have heard from multiple members that they are finding errors in the number of years or level of education listed. If you find yours to be incorrect, please send an email to U-46 Human Resources at HumanResources@u-46.org and CC me on the email. Only 4:00-8:00 times are available for ETA members to observe. 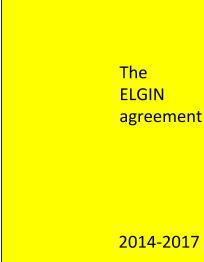 I am thankful for every single member of the Elgin Teachers Association. No matter the challenges and obstacles you face, you report every single day, maintaining an incredible level of professionalism, and working hard to educate our students. Thank you for all that you do.